Too often, B2B marketers get wrapped up in the world of click and lead volume optimization. But the reality is, the ultimate goal of all marketing should be efficiently generating revenue growth, which is measured by ROI. In short: effective marketing organizations have high ROI. So, what defines a high ROI marketing team? Do they have different priorities? Are these marketers using different technology to engage with customers and measure performance? At Bizible, we run an annual survey with a group of great partners to discover what marketers are doing to make an impact at their organization. 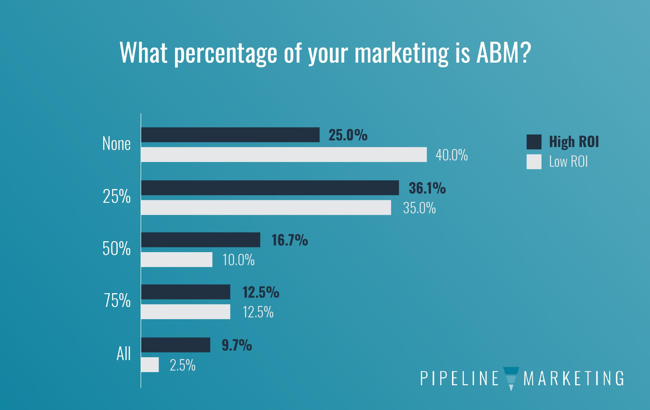 Taken by more than 400 marketers, this survey produces a ton of data and insights which we then compile into the State of Pipeline Marketing. But between all the pivots and threads of insight, especially when it comes to ROI, there’s way more than we can fit in the report. 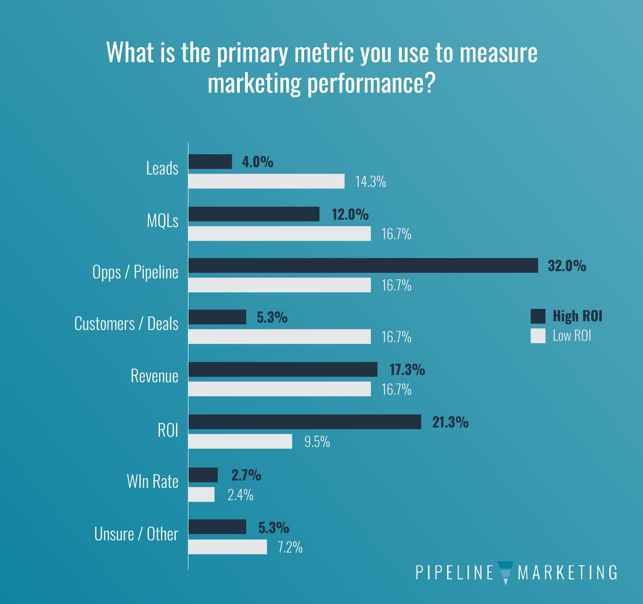 We dug into the data to analyze the characteristics of high ROI marketing teams. Of the marketers who knew their marketing ROI, 47% reported ROI greater than 1.5x, which is how we’re defining high ROI teams. Conversely, 26% reported negative or break-even (1x) ROI. A significant component of delivering high ROI is being able to measure it. That requires connecting your spend data to downstream pipeline and revenue. And it’s no surprise that high ROI marketing teams do this better. 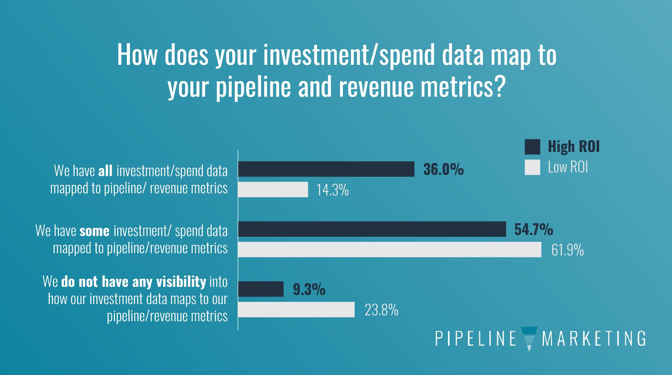 While only about a third of high ROI teams map all their spend data to revenue data, they are 152% more likely to do so than organizations with breakeven or negative ROI. High ROI marketing teams make good plans that their teams’ believe in. 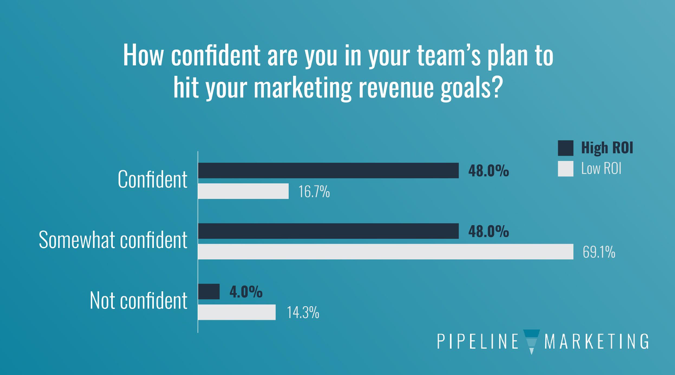 When asked how certain they were in their team’s plan to hit their revenue goals, those with high ROI marketing teams were 188% more likely to be confident. What makes those plans good? High ROI organizations are also 85% more likely to make their plans based on pipeline and revenue than their low ROI counterparts. Aligning goals (and therefore, incentives) with the broader business improves performance. When marketing, sales, success, finance, etc. are all on the same page, everything runs more smoothly. There’s better communication because everyone is speaking the same language, departments are more willing to work together and collaborate, and execution is aligned. 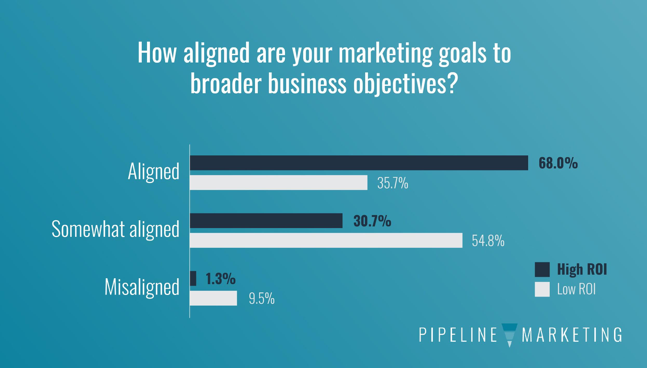 It’s no surprise that high ROI marketers are also more likely to be aligned with the rest of the business. You manage what you measure! Multi-touch attribution gives marketers visibility into how all marketing efforts are performing no matter where they occur in the buyer journey. If they’re making an impact, they’re getting measured. With great measurement data comes better planning, which feeds into better execution. 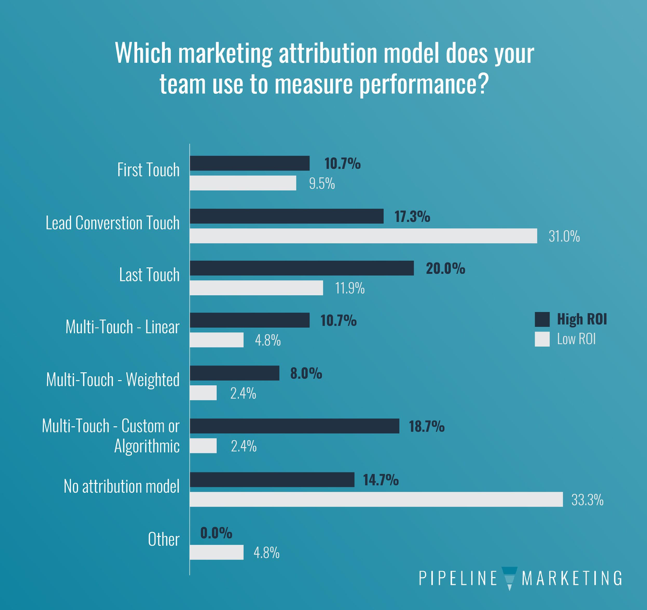 The data backs it up: high ROI marketing teams are about three times more likely to use multi-touch attribution. This is a “chicken or the egg” scenario. 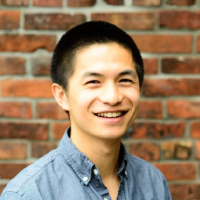 Do high ROI companies earn their revenue center reputations? Or do organizations that see marketing as a revenue center give their marketing team the support they need to be a high ROI team? It’s often easier to have high ROI on a small budget because you can pick the low hanging fruit. While there are definitely economies of scale that go into work as organizations grow, it can also be tough to scale programs that enable marketing organizations to grow fast and efficiently. The survey results found that high ROI organizations can do both. 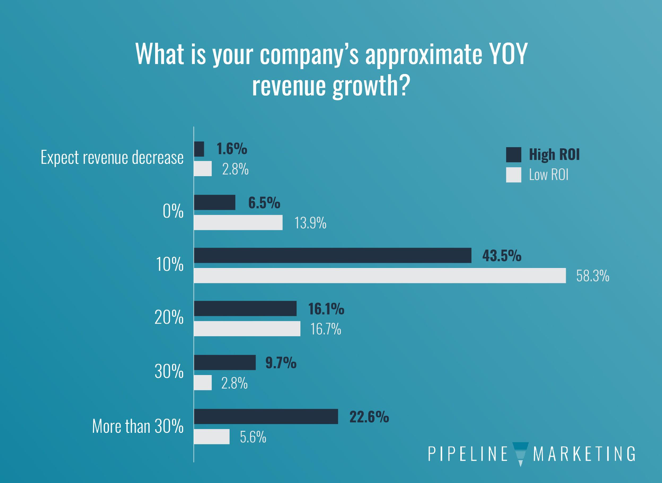 They are 94% more likely to have year-over-year revenue growth higher than 20%. So, what’s the takeaway? Organizations can plan, manage, and optimize for what they can measure. If you want to be a high ROI marketing team, you need to be able to deeply and accurately understand marketing’s revenue impact, and be able to map it back to your plan and your spend. For more great insights, check out the 2018 State of Pipeline Marketing Report.